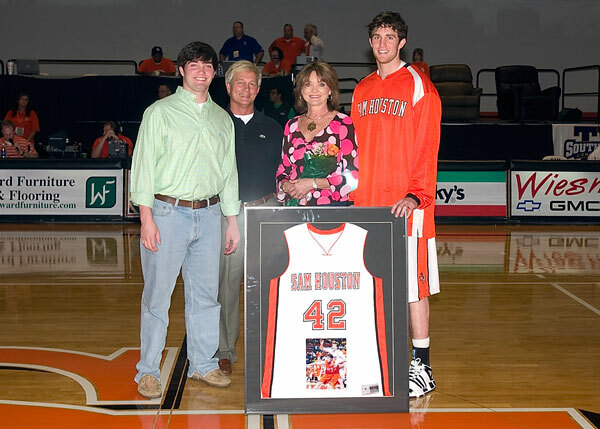 Barkley Falkner (far right) is shown with his parents, Ley and Donna, and his brother, Reed, at Senior Night 2009 for the Bearkat men's basketball team. Just like his famous great-great uncle with the same last name, Barkley Falkner, a Sam Houston State University student from Oxford, Miss., is an award-winner. However, unlike that other Faulkner — the Nobel Prize-winning novelist, short story writer, and arguably one of the 20th century's greatest writers named William — many of Barkley's awards have been bestowed upon him as a student-athlete, in basketball no less. That is significant, because even though Barkley and William share DNA, there is a tremendous discrepancy in their heights — William was 5 feet, 5 1/2 inches tall, and Barkley is 6 feet, 8 inches tall. And just to be clear, although they are members of the same family, the spelling of their last name is different. There are stories about that, too. Historical references cite a couple of reasons why William spelled the family name with a "u" instead of the way it was originally spelled, without the "u." One source says that after being rejected by the U. S. Army because of his height, Faulkner joined the Canadian and then the British Royal Air Force. In an attempt to appear British, he spelled his name "Faulkner." 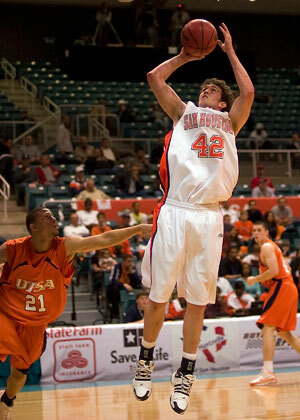 Barkley Falkner in the SHSU vs. UTSA game. Another story tells that a careless typesetter made an error in the spelling of Faulkner's name on the title page of his first book, and Faulkner chose not to change it. However, Barkley says that family lore indicates that the real reason the name was changed was because the Falkner family did not want to be identified with some other Falkners in northern Mississippi. So when the Oxford Falkner brothers joined the army, they added the "u" to their name to distinguish themselves. After the war, some of the brothers left the "u" in the name, and others took back the original spelling. Barkley, whose ancestor chose to stay with the Falkner spelling, always knew he was related to the literary genius, but he didn't realize just how famous the Faulkner name was until he was older. "Our family would talk about William, especially when my grandfather was alive," said Barkley. With several family members living in the Oxford area, being a Falkner/Faulkner has a bit of celebrity status. "When I was growing up, my teachers were the ones who brought the family connection up," he said. "I quickly let them know that I didn't get the writing ability that William had," he said with a laugh. "My academic strength is in math." And strong that math ability is. Barkley is graduating from Sam Houston State University next month with a 3.9 grade point average in accounting. Earlier this month, he was named the Capital One Bank/Southland Conference Men's Basketball Student-Athlete of the Year. He was named to the SLC Academic All Conference first team this year and the second team last year and is a three-time selection to the SLC Commissioner's Honor Roll. His other honors include being elected an officer for the SHSU Student-Athlete Committee and being selected for membership in Beta Gamma Sigma accounting honor society and Golden Key International Honour Society. He has also been named to the SHSU President's Honor Roll and the Dean's List. As a Bearkat at Sam Houston State, his famous name hasn't drawn quite as much attention in Texas as it did in Mississippi. "Occasionally, when I'd go to one of my accounting professors for help, they'd ask if I was related to William Faulkner," he said. "I told them 'yes,' and that was it." With the end of the academic year on the horizon, Barkley is looking toward the future and has several options. He would like to play professional basketball overseas, sit for the CPA exam, or go into coaching. Or he may do all three. Regardless, with Barkley's reputation as a hard-working and bright individual, he won't have to rely on the family name to get where he wants to go.